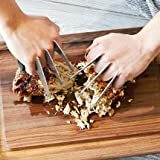 Channel your inner superhero or hungry grizzly bear when you grab, lift, and tear apart your favorite meats in seconds with these cool new Slash and Serve Meat Shredder Claws from Charcoal Companion. Just slide your fingers around the handles of these sharp wearable stainless steel claws and embrace your animal side as you quickly shred large cuts of meat like roasts, turkeys, chickens, pork butts, hams, and more with ease. Unfortunately, these exciting kitchen claws do not retract back into your hands, but they are dishwasher safe. Size: 2.13" x 4.17" x 4.96"